View More In Cutlery & Knife Accessories. The Norton waterstone starter kit includes the basic elements needed for sharpening tools and knives using waterstones: a 220/1000-grit and a 4000/8000-grit combination waterstone, each measuring 1/2 x 8 x 3 inches (H x W x D); a 3/4 x 9 x 3 inch coarse-grit silicon carbide flattening stone; and an instructional DVD. (H is height, the vertical distance from lowest to highest point; W is width, the horizontal distance from left to right; D is depth, the horizontal distance from front to back.) Each waterstone comes in a hinged plastic box, with no-slip rubber feet, that protects it and provides a reservoir to keep it moist. The removable box lid acts as a sharpening station to hold the stone in place during bench sharpening. The silicon carbide flattening stone is used to maintain smooth sharpening surfaces on the waterstones. The instructional DVD demonstrates a freehand waterstone sharpening method. The sharpening stones are used in sequence to restore the cutting edge on straight-edged tools, such as chisels, plane blades, and precision instruments. The 220/1000-grit combination waterstone is suitable for repairing and then establishing the cutting edge. The 4000/8000-grit combination waterstone is suitable for maintaining or refining, and then polishing the cutting edge. 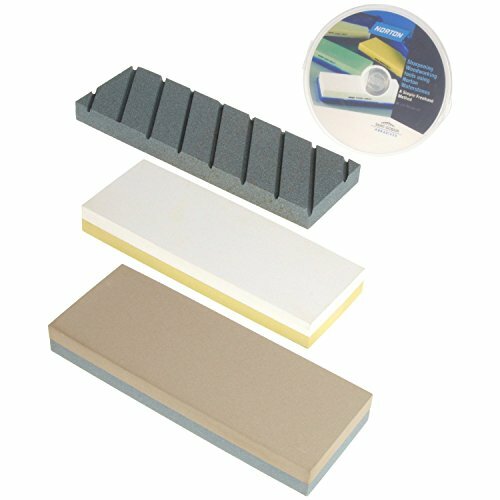 The silicon carbide flattening stone is used to smooth the sharpening surfaces and flatten the depressions that repeated use wears in a waterstone, to prepare it for effective sharpening of knives and tools. These synthetic waterstones are created by grading abrasive material to a consistent particle size and blending it with bonding agents. Next, they are molded and surface-finished. Waterstones have a finer grit and softer bond than oilstones, and use water as the lubricant to develop a slurry, a thin paste of abrasive grains and water that removes metal with less pressure than an oilstone requires. Cleanup is easier than with oil as lubricant. These stones conform to the Japanese Industrial Standard (JIS) for waterstones. Sharpening stones, or whetstones, are abrasive surfaces used to sharpen and hone the edges of steel cutting implements such as chisels, knives, scissors, hand scrapers, and plane blades. Sharpening is the process of creating or re-establishing a cutting edge by grinding away portions of the metal to adjust the angle of the edge and reform the shape. Honing removes small imperfections. Stones can be flat, for working flat edges, or shaped, for edges that are more complex. Sharpening stones are made of natural or synthetic materials that range from softer to harder, and are categorized by the size of their abrasive particles, known as grit. A stone with a coarser grit is used when more metal needs to be removed (e.g., when sharpening a nicked or very dull blade); the stone with the finest grit produces the sharpest edge. Where numbers are assigned to specify grit, they range from coarser grit (low) to finer grit (high). Some sharpening stones are designed for use with a lubricating liquid, some can be used dry, and others can be used either wet or dry. When used with lubricating liquid, a sharpening stone can be called a waterstone or an oilstone, based on the lubricant required. Norton Abrasives manufactures sanding, grinding, and polishing abrasives, and has been located in the United States since 1885. Norton, now a brand of Saint-Gobain, meets ISO 9000 and 14001 certification for quality and environmental management standards. If you have any questions about this product by Norton Abrasives - St. Gobain, contact us by completing and submitting the form below. If you are looking for a specif part number, please include it with your message. Knife Set, Kitchen Chef Knives - Stone boomer 14 Piece Knife Block Set, Stainless Steel Knife Set, Chef Knife Set, Knives Set, Scissors, Sharpener & Acrylic Stand, Super Sharp,!! !